I'm a big fan of collaborations. When you put two creative minds together, good things are bound to happen. 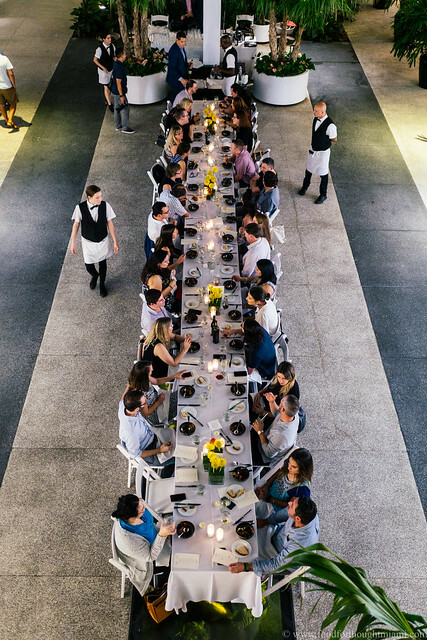 Yet many "collaborative" dinner events turn out to not really involve all that much actual teamwork. 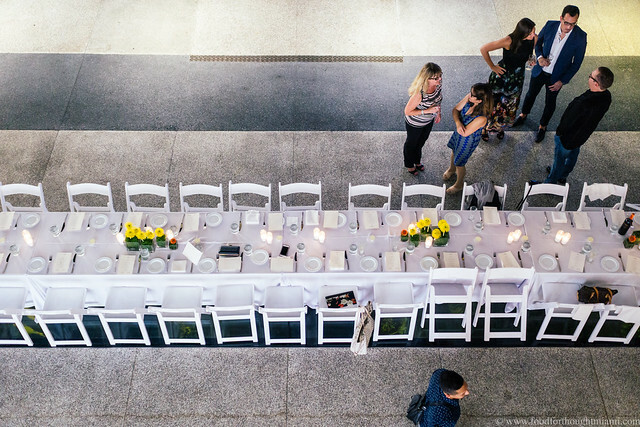 Sure, the chefs will communicate about a menu and ingredients, and decide who is going to do what. 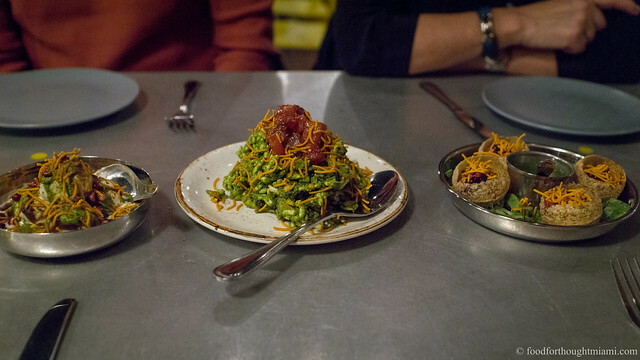 But more often than not, they're ping-pong-ing courses back and forth, rather than working together to create dishes that are a genuine combined effort. 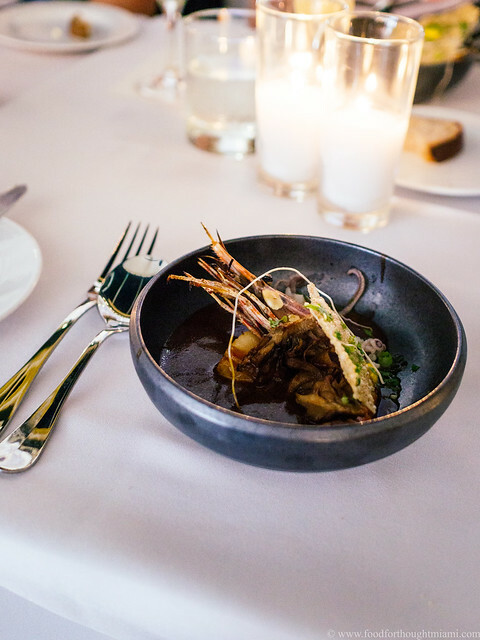 Which is one of the things that made our Cobaya dinner last week with chefs Julian Baker of Le Zoo, and Anthony Micari of Makoto, so special: each dish seemed to bear the imprint of both chefs, and both kitchens. They had some advantages in doing so. 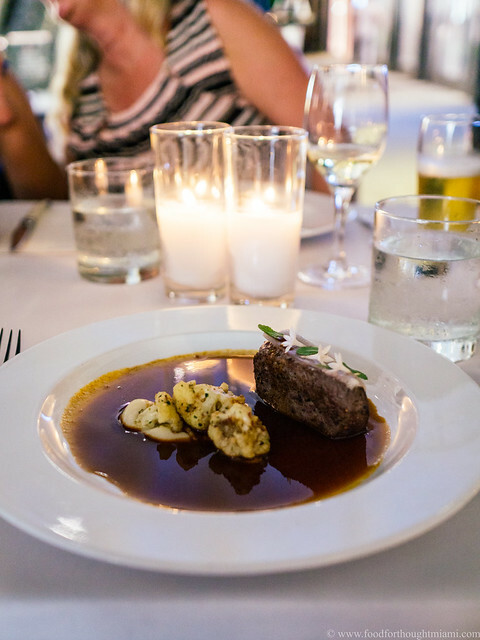 The French bistro and contemporary Japanese restaurant are neighbors, both housed in the posh Bal Harbour Shops. They are also siblings of a sort, both under the management of Stephen Starr's Starr Restaurant Group. 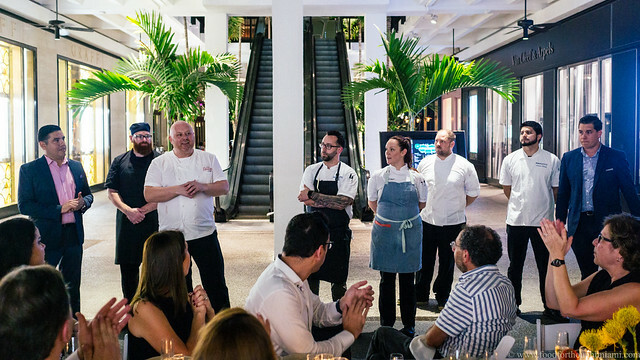 And they're both Cobaya alumni, in a way: Chef Baker hosted Cobaya Experiment #40 while he was chef at Toscana Divino in Brickell, and Makoto's namesake, head chef Makoto Okuwa, was the host for Cobaya Experiment #32. Guinea Pigs starting to make their way in for Cobaya Experiment #75. 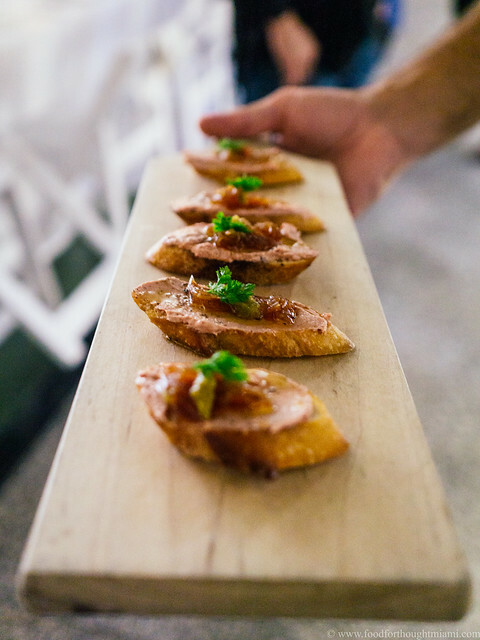 A snack as guests arrived, and a preview of what's to come: toasted baguettes smeared with a rich, and very French, chicken liver mousse, topped with a zingy, spicy, and very Japanese, yuzu kosho marmalade. "Toro Niçoise." Chef Micari marinated block cuts of fatty tuna sashimi in soy sauce, toro zuke, style. 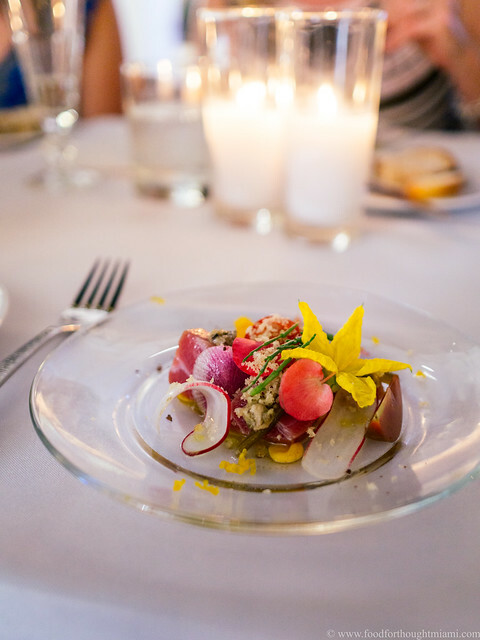 Chef Baker brought the flavors of the Mediterranean: pickled haricots verts, tomatoes, niçoise olives, slivered radishes, a delicate squash blossom. Someone threw in some fudgy, Szechuan-spiced egg yolk, which was a very good idea. This was a great start. "Japanese Bouillabaisse." Chef Micari brought some seafood from Tsukiji Market in Tokyo: gorgeous head-on shrimp, silky scallops, delicate baby calamari. It arrived at the table in a bowl with a rice puff rubbed with saffron aioli, the traditional accompaniment to a Provençal bouillabaisse. The dish was then finished with a tableside pour of a rich, heady, spicy seafood stew that had been enriched with red aka miso. I really love venison when it's cooked well. This one nailed it, seared outside but still ruby within. Venison done right like this is tender like a filet mignon but so much more flavorful. The loin was bedecked with a strip of lardo to give a little richness to the lean meat, and set on a plate with a rich juniper jus and cauliflower both roasted and puréed. This dish started with ducks that Chef Baker had confited at Le Zoo. In the afternoon, he walked them over to Chef Micari at Makoto, who glazed them with kabayaki sauce (the sweet-soy sauce typically used for barbecued eel) and grilled them. 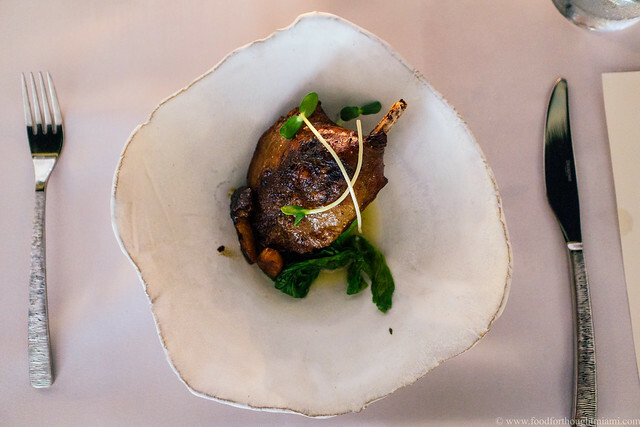 They got plated with plump, meaty robata grilled royal trumpet mushrooms, bright green baby bok choy, and a dappling of beurre noisette. Now that's collaboration. 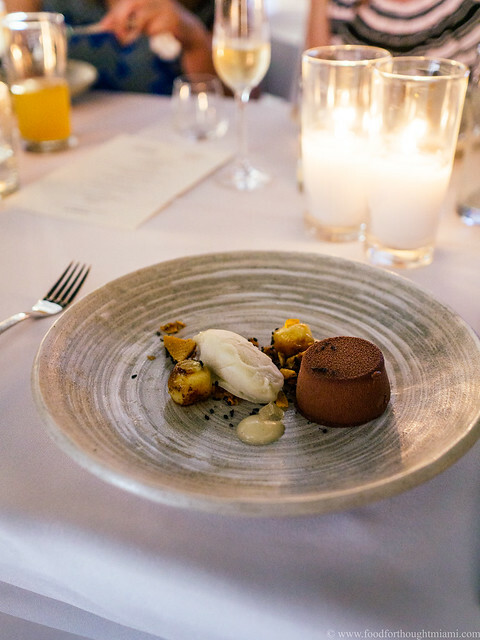 For dessert, the pastry chefs put their heads together for a final course that again merged the flavors of Japan and France: a creamy chocolate cremeux, crunchy sesame brittle, yuzu curd, bruléed banana, and icy banana sorbet. There was a really nice contrast here between some very deep, roasty sesame flavors, and the banana which was done just slightly under-ripe so it was more fruity and tart rather than all caramelized sweetness. I would be remiss in not mentioning the beverage pairings, which were spot on throughout. I particularly enjoyed a bright champagne, armagnac and yuzu cocktail which started off the festivities, the pairing of a favorite beer – Hitachino Nest White Ale – with the venison, a nice Burgundy to go with the duck, and an intriguing idea for a nightcap: a shot of mezcal with a champagne chaser. A big thank you to chefs Julian Baker and Anthony Micari, to all of their crews at their respective restaurants who really made the night special, to the folks at Bal Harbour Shops who accommodated us, and as always most of all, to the guinea pigs whose interest and support make these events possible. Can I just note here how phenomenally good Starr is at the restaurant thing? The restaurateur who brought Morimoto to the U.S. in 2001 has developed a portfolio of venues that strike a winning balance between "chef-driven" and "financially successful," ranging from crowd-pleasers like The Continental and Buddakan to more personal vehicles like Daniel Spring's Le Cou Cou, Justin Smillie's Upland and Jason Atherton's The Clocktower.